A Boules area was installed by the council in the Cerizay Garden to mark the 25th Anniversary of the Town’s Twinning with Cerizay. This pitch is available for all and it is hoped that residents will enjoy this feature. Petanque, the most popular bowling game in France, is better known outside its home country by the more colloquial name ‘Boules’. The modern game is thought to have descended from a centuries-old version traditionally played on beaches by sailors on shore leave, in which cannon balls were used in place of today’s specially-made balls. Players throw the steel balls (boules) as close as possible to a smaller wooden ball (the cochonnet or jack), whilst trying to displace their rivals’ boules to a further point. 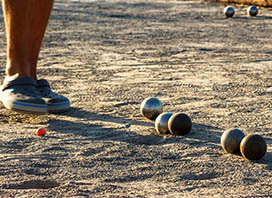 Petanque is traditionally played on a sun-baked clay pitch of about 12 metres in length. There are strict rules about this in competition, but the vast majority of participants play for fun using whatever ground is available, typically a beach, lawn or gravel driveway. Eight boules are supplied as four pairs, each pair with a distinguished pattern to identify it to a particular player. A ruler is useful for measuring small differences in distance (traditionally, this has special markings and is called a baguette) . Petanque can be played by two,three, or four people. A two person game is played using four boules each. 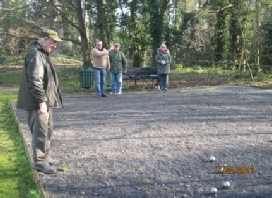 A three person game is played using two boules each. A four person game can be played using two boules each, or (more usually) with two teams. Standing at one end of the pitch, the first player marks their position by scratching a circle in the ground around them, (originally with the baguette). From this circle they throw the cochonnet such that it lands in the furthest third of the pitch, but not within (39”) of the boundary. If the cochonnet does not land in an appropriate position, it must be thrown again by the same player until it does. One round of a game is called an end. In each end, the party with the closest boule to the cochonnet wins. They score one point for each of their boules that is closer than the closest boule belonging to a rival (so score could be one only). The maximum score for a two player/team game during one end is thus four points (if all the boules of one team are closer to the cochonnet than any of those belonging to opponents). A whole game is won by scoring 13 points (requiring at least four ends). The winner of an end becomes the first player of the next, starting from the finishing position of the cochonnet in the previous end.